One of my favorite fall activities often turns into lots of fall baking! We went apple picking and ended up making several baked goods. These cookies hands down stole the show. It was a lovely day full of apple sampling and after hours of apple baking, we created this product. 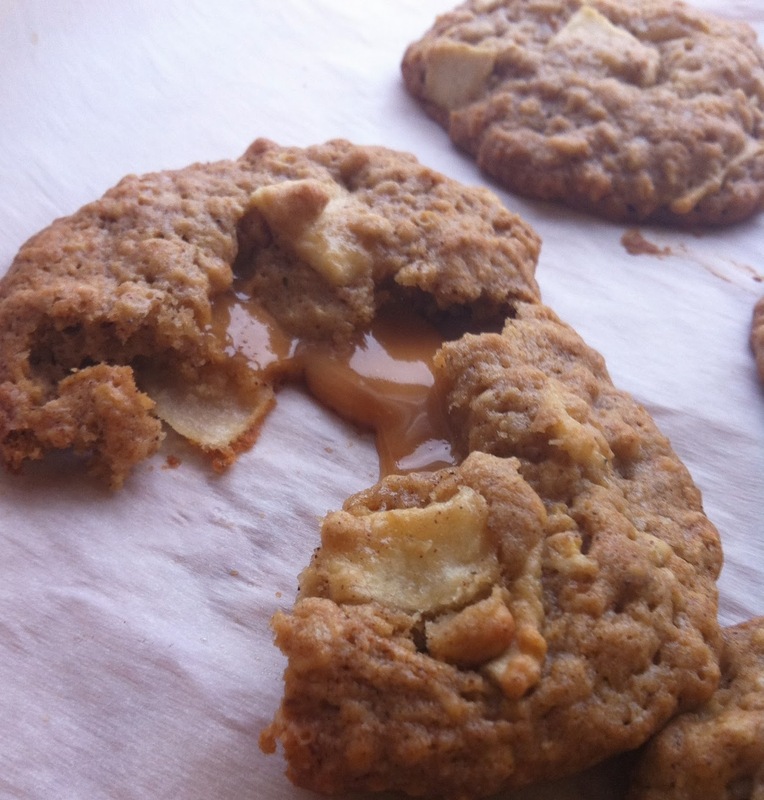 It’s like an oatmeal raisin cookie in consistency, but full of bits of apple and gooey caramel. My fellow chef cut these apples into perfect “dime-sized” apple slices but I’d imagine that chopping them into small bits and pieces would yield equally delicious results. We also played with varying amounts of caramel to yield a variety of cookies with just a bit of a caramel center to absolutely brimming with oozy caramel. Prepare your apples by peeling and cutting them into thin dime-size pieces as we did, or simply chop into small cubes. Toss the apples in sugar and flour until well coated and set aside. Cream your butter, granulated sugar, and brown sugar until well combined. Add your eggs in one at a time followed by vanilla and maple syrup. In a separate bowl, combine the flour, vanilla pudding mix, oats, baking soda, salt, nutmeg, and cinnamon. Slowly add this mixture to your butter and sugar mix until well combined. Once the two mixtures are well incorporated add your apples! Line your cookie sheet with parchment paper. Taking about 2 tablespoons of your dough, place a caramel in the middle and roll your dough around the caramel until completely covered (hands work best!). Place your cookie (with caramel surprise!) on your cookie sheet. Make sure to keep your cookie dough balls about 2 inches apart. They spread! Bake for 12-15 minutes and let cool for a few minutes before moving. These are best served warm with gooey caramel so you can always pop them in the microwave for a few minutes before serving to re-melt the caramel. Tip: If you don’t want as much caramel, you can cut the caramel in half. Also, you can flatten the caramel to a disc shape and shape your dough around this – enabling you to start with an already flattened dough instead of a round mound of dough. Either way, it will be delicious.